The Gimelstob residence incorporates a series of separate volumes that engage the land and establish a sense of place. The formal investigation focused on how a program can be articulated through a separation and reconsolidation of the parts through an interlocked and composite manipulation of both plan and section. The section, not the plan, is used to create the site integration. The drive wraps around the house and slopes down a full level to the autocourt and garage. One enters at the lower ground level or ascends a major exterior stair that returns to the meadow level of the main house. 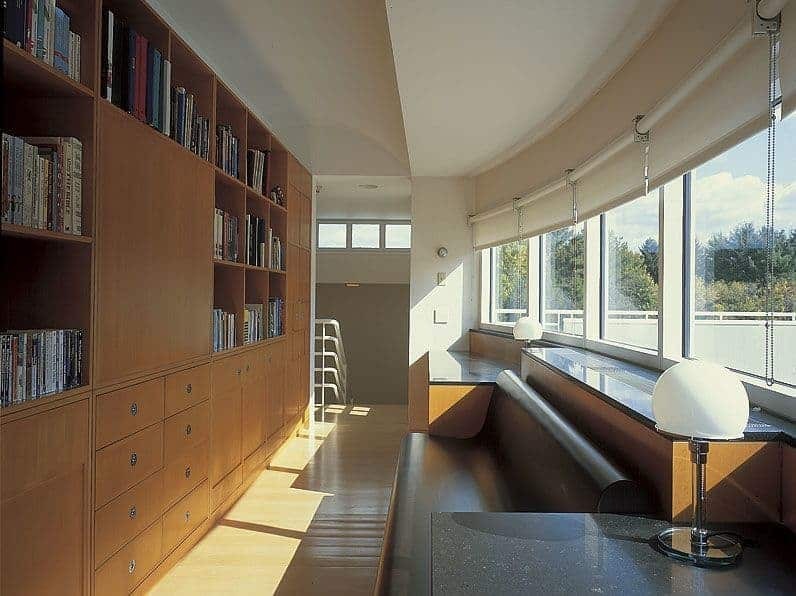 The living space is a double-height, encapsulated rotunda, which is the central and centroidal organizing space. It is iconic and skylit, establishing the presence of the building on the site. Additionally, it is an exploration of geometric erosion that results in the figural and articulated solid/void manipulation of the space itself. On the ground level of the rotunda is the living room, flanked by a sitting area and a dining space, as well as the kitchen/breakfast room, which opens to the pool terrace. On either side of the circulation balcony on the upper level is the library and master bedroom suite, both of which overlook the main living space. The “children’s house” is articulated as its own wing. It is a four-story building set into the ground, reducing its perceived volume and anchoring the entire composition. It has its own organization as well as its own internal circulation system. There are two levels of children’s bedrooms accessed by circulation galleries: the upper-level gallery opens to a major roof deck, facing south; the lover-level gallery overviews the gymnasium space. Underneath the lower-level gallery and bedrooms is the gameroom. There is a dense vertical stacking and sectional complexity that is not revealed from either side of the site. As one descends, the spaces become larger, wider and unexpected—a reverse sequence to the main house.